It's hard to say if astronaut Chris Hadfield is prepared to kiss a codfish to publicize his upcoming mission on the International Space Station. However, a group of sixth-graders found a way to make that Newfoundland tradition possible. On the Canadian Space Agency (CSA) website, they posted a picture of themselves, an image of Hadfield, and a rather large cod. The image is just one of more than 240 entries made so far as part of a CSA photo contest. The agency is inviting Canadians to take pictures of Hadfield with them around the world, challenging them to snap the two-time astronaut in a location he has never visited. Entries show 2D Hadfield in locations ranging from a red carpet beside Canadian pop star Justin Bieber, to an Icelandic geothermal plant, to the Anne of Green Gables house on Prince Edward Island. Behind the fun snapshots, the Canadian Space Agency has a serious purpose: To promote Hadfield's mission to the International Space Station this December. "Obviously, the Canadian Space Agency wishes to raise the awareness of the Canadian space program," said spokesperson Carole Duval. "This [mission] is the ideal time to try and promote what we do in Canada." Anyone in the public who is a Canada citizen can vote for their favorite photo posted to the CSA website. The grand winner with the most votes will have the chance to talk to Hadfield himself after he lands. The photo contest is a first for the CSA. As such, employees are eagerly using their own time and resources to generate clicks for publicity. 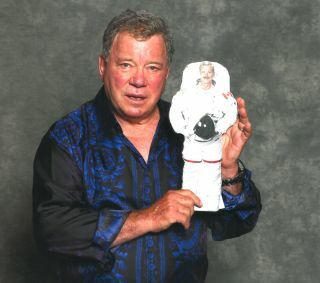 One intrepid employee lined up for hours at a Montreal comic convention, 2-D Hadfield image in hand, to meet William Shatner. The legendary Captain Kirk from "Star Trek" granted a few moments for a stern-looking photo with Hadfield's likeness. "You should have seen the exchange of e-mails over the weekend," Duval said with a laugh. "We were so eager to come in the office on Monday to see it. We have a few gems in our collection so far. It's a lot of fun." The light-hearted contest comes at a serious time for the CSA, which is struggling with declining budgets amid a round of government cost-cutting this year. The agency faces a 25-percent cut in funding for fiscal year 2013 and is doing an internal review to determine where best to allocate funds. When an astronaut flies into space, though, it brings a round of goodwill to the CSA from the media and the public. Hadfield in particular is well-known to Canadians due to previous "firsts" in space, including the first spacewalk by a Canadian and being the only Canadian visitor to the Mir space station. Hadfield, a former test pilot who has been an astronaut for 20 years, is an old pro at publicity and eager to raise awareness for Canadian space activities, Duval said. "He's a great speaker. He really is the best person to talk about the Canadian space program," Duval said. "When we propose activities like this, he says, 'Yes. This is great. Let's get people involved, and let's have fun as we learn.'" Canadian students who prefer a more practical way of getting involved in the Hadfield mission can submit a science experiment idea for consideration. Hadfield will conduct the winning experiment (these will also be voted on online) on board the station in 2013. Students are provided with a list of items that Hadfield has on board the station, and asked to devise an experiment using these tools only. Available tools include anything from an athletic headband and electric tape (specified in red, green and blue) to limited amounts of water and condiments. The science-experiment contest runs until Dec. 31. A panel of scientists will then review the submissions and pick the top 10, which will be publicized on the CSA's YouTube page where viewers can vote for their favorite experiment. Entries will also be put through a strict safety review that NASA has for all experiments on board the station, Duval noted. CSA will announce the winner in February. To enter the Hadfield photo contest and view entries, visit the CSA's site here. The contest runs until Chris is scheduled to land on May 16, 2013.